Balayage is a French term meaning to sweep or to paint. In hairdressing, balayage is a free-hand colour technique most commonly used to give brown hair that natural sunkissed look, but people’s creativeness and individuality has evolved it to apply to almost any colour – it just depends on your personal style. We have been doing balayage colouring for ages and on all types of hair! Here’s the Lily Jackson Hair & Makeup take on balayage hair colouring – we’d love to create a beautiful colour and hairstyle for you so please call us and come in for a chat. Why is it important to seek out a hair stylist who is experienced with Balayage? Balayage and Ombre are complicated colour techniques. The hair colourist must have a high degree of skill and creativity to achieve a flawless finish that has the shades and tones flowing seamlessly to create a beautiful result. 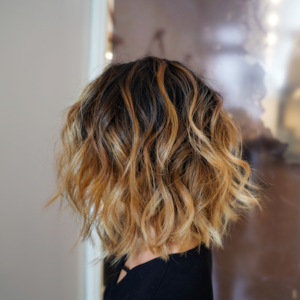 There are many different ways to execute balayage and ombre and it is important to see an experienced technician so that the right techniques can be used for the individual look you are seeking to achieve. Your colourist will also need to have control and knowledge on what shade your hair will lighten to and how to tone the ends of the hair to achieve the look you are after. There’s a big difference between a dip-dye, an ombre or sombre, a balayage or hair contouring! If your Colourist doesn’t understand a variety of colour application techniques, you could be the poor girl walking down the street with the tried-but failed unblended balayage hair colouring! What constitutes a BAD Balayage? A colour that is supposed to be balayage and ends up looking like a dip dye because the colour technician does not know how to apply the colour to achieve the gradual flow and transition. Why should you consider having balayage hair colouring? Balayage and hair contouring is a great way to enhance your natural hair colour, add texture to hair or try something new if you’ve never had colour before. It’s completely adjustable to your look and different tones can be chosen to suit every skin tone. It’s very low maintenance once the end colour is achieved but that does not mean NO maintenance. It’s a colour service that can grow out and still look “natural” or as some like to call it “lived in” but balayage, like all colour services does benefit from having the colour refreshed periodically. A toner to refresh brassiness or yellow gold tones that can creep in due to environmental factors is a great way to keep your colour looking good. Professional haircare will also go a long way to keeping your colour fresh and hair healthy. Balayage that uses creative colours like purples or reds require more maintenance. How often does balayage need touching up? This depends on the look that you go for and the tones you choose. In general Balayage and Ombre are lower maintenance than other colour services, but low maintenance does not mean NO maintenance! All hair colour fades, including balayage. Hair that has been lightened and toned to a specific shade can be a little more porous and prone to fade. Simple washing, drying, use of high heat from tongs, air conditioning, sunshine or sea salt and poor quality supermarket hair products will all create colour fade. If you are using your natural hair colour as a base, usually a visit every 12 weeks is sufficient. As your hair grows, balayage colour will need re-touching, just not as often as a solid tint or foils. A toner, colour shine or a gloss in between colour retouches will refresh the tone and care for the hair. If you have used a different base colour on the roots, or if you are covering grey hair then you will need to touch up the roots and base colour every 6-8 weeks (or more frequently if you have a lot of grey hair). The balayage portion of your hair will only need touching up every second visit if cared for properly. What are some “special” balayage techniques? Back combing or teasing the hair before colour application – backcomb into the root and it softens the colour, creates a finer more natural highlight, soft graduation or blend – think eyeshadow that is blended and softened. Might use foil if product is colour is runny to avoid colour bleed (where the hair with colour on it has touched hair that should not have colour to create streakiness or unwanted patches of colour). The cost of having a balayage colour depends on the result you are after. Some balayage is as simple as lightening pieces of the hair, other balayage is more dramatic and uses a lot more colour which will affect the final price of the service. The look you are after might require you to change your base colour as well as the colour on the lengths of the hair. If you have Asian hair: it can be particularly more difficult to lift (make lighter). If you want your hair to be very light blonde or a mix of tones it can take two or three sessions to achieve the final look. As balayage is a bespoke service and tailored to the look you are trying to achieve, we recommend you have a consultation and receive a quote that takes into account everything that you will need. Quotes will take into account including the type of colour being used, the amount required to achieve the look you are after, allocating the right amount of time for your service, allowing time for a toner or treatment if needed, adding on a haircut and blowdry to get your dream hair, and getting recommendations on the right professional hair care to keep your dream hair looking its best!